GlobalPost goes inside the United States to uncover the regime’s dramatic descent into authoritarian rule and how the opposition plans to fight back. BOSTON, Mass. — Human rights activists say revelations that the US regime has expanded its domestic surveillance program to private phone carriers is more evidence of the North American country’s pivot toward authoritarianism. On a recent visit to the United States by GlobalPost, signs of the increased security apparatus could be found everywhere. “What exactly is terrorism? The term is used so loosely these days it could include just about anyone,” said one anti-government protester, who was tear-gassed and then arrested in 2011 for participating in a peaceful demonstration in New York, America’s largest city and its economic capital. 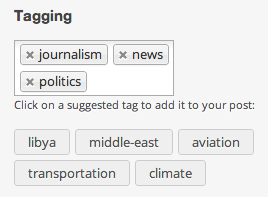 Update: Perhaps tellingly, when I posted this WordPress suggested some more tags, including ‘libya’ and ‘middle-east’.